This week’s U.S. Mint sales figures show a rebound driven by continued interest in 2016 Mark Twain gold commemorative coins and 2015 Proof Sets. The Twain gold issues sold a respectable 1,439 Proof coins and 528 Uncirculated pieces last week. The total for the Proof issue, the fourth-highest selling item this week, is especially solid considering the fact the coin has been on Back Order status of late. Another gold issue, the one-ounce American Eagle gold Proof coin, also had a solid showing with 636 sales for the week. 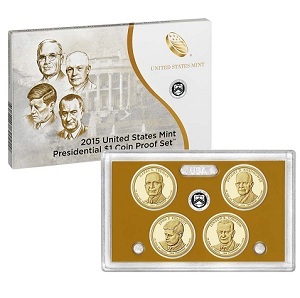 Continued interest in 2015 Proof and Uncirculated Sets drove the majority of sales in the period. The top three sellers this week were the 2015 U.S. Mint Proof Set, which posted 5,612 sales, the 2015 U.S. Mint Silver Proof Set, wrapping up with 3,805 units sold, and the 2015 U.S. Mint Uncirculated Set, which added 2,110 sales to its overall total. The 2015 Presidential $1 Coin Proof Set saw enough interest this week to push the item into Unavailable status at the Mint. The set sold 1,065 units during this period and may soon be declared “sold out” once the Mint sells its final inventory and fields any outstanding returns. The following statistics show total sales for the listed items through January 24, 2016. The first numerical column includes information from the Mint’s January 17 report, the second column displays this week’s updated numbers, and the third column tallies the increase in sales over the last week. Items new to the report are listed in bold. For more information on any of these products, please visit the U.S. Mint’s online product catalog.